Adventures with horses from writer Cindy Hale. I was a horse crazy girl who grew up to be a horse crazy woman, and I’ve dragged my non-horsey husband along on the adventure. 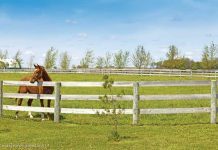 Whether I’m trail riding, judging shows or dealing with the challenges of backyard horsekeeping, my life is never dull. Fortunately, like most horsewomen, I came equipped with a good sense of humor. More things than memories fade with time. Longtime horse show competitors know that their blue ribbons eventually fade to a shade of purple that ranges somewhere between grape Kool-Aid and wilted lilac. Except for a handful of treasured ribbons I keep cloistered in a dark closet, most of my ancient first place ribbons have also gone the way of vintage violet. Love them or detest them, chances are a pony has contributed to your love of horses. Many of us had our first ride aboard a pony (I know I did) and experienced our first injury due to a naughty pony (me again). I recently spent a whirlwind couple of days judging a pair of shows. Saturday’s show was a laidback, in-house schooling show that offered a mix of western and English classes. Sunday’s show was much more intense. It was a county-rated hunter show with many exhibitors intent on winning equitation medals. And yet I still thought of my blog! During momentary breaks in the weekend’s activities, I decided to jot down some suggestions that might help those of you who show. How long must you own a horse before its spirit finds a home in your heart? Is there a certain time limit, measured in rides or nuzzles or stall door secret sharing, that must be met before you’re allowed to say, “I truly loved that horse”? “We’ll put you on Buster Brown. He’ll dump you.” I’ll never forget those words that greeted me many years ago. I had just started work as an assistant to a then-famous A-circuit hunter and jumper trainer. His barn manager, Patty, seemed determined to tarnish my crown as a respected show rider. I’m sure she viewed me as yet another hunt seat princess who looked pretty on a horse but lacked any true ability to actually ride. Spring doesn’t last long out here. The season’s mild weather and cool mornings stick around for just a brief visit. In fact, spring always seems in a hurry to go someplace else, like a party guest who grabs a snack, sips half a drink, says a few hellos and then splits. Then the door opens and summer makes a grand entrance, complete with balmy nights, dry winds and oven-fresh heat that makes riding before noon a necessity. Many of you probably live in far more rural areas than me. Yet by southern California standards our small acreage is an untamed wilderness. I’ve encountered snakes, coyotes, roadrunners and cottontail bunnies in my yard. Either our house is situated on a crossroads of wildlife travel or our landscaping, based on native plants, attracts them. I’ve started a small business with my equestrian-themed mosaics. I keep a little TV turned on in the background while I snip glass tiles and glue them in place. Over time I’ve realized there are a whole lot of so-called “reality” shows. On my satellite dish (which offers the same viewing menu as cable) dozens of channels are contaminated with them. Yet there are very few that hold my interest. I believe that some of them should be tweaked to become more appealing to horse folk like us. During the years I rode green horses I was always aware that the colts and fillies were blank slates. If I worked with them for six months and they ended up with holes in their basic training or nasty vices, there was no one to blame but me. I’ve been busy. Horse show season has begun, and that means that I’m spending at least one weekend a month judging. I had a break during my last judging assignment while the jumping course was adjusted for the pony hunter classes. I took that time to gobble my lunch (a BLT with avocado) and also jot down a few horse show tips to share here on my blog. Are You Sure You Want to Trail Ride in That Halter? Yes, dear readers, I have another installment of, “Trust me. You Really Shouldn’t Do That.” This intermittent series presents bad ideas and misguided tactics I witness in my local horse world. This time around I’m tackling a trend I see gaining in popularity: riding a horse on the trails in a halter. Among the pantheon of crazy old horsewomen I’ve met in my life is a wildly erratic, stormy-eyed widow I’ll call Doris. I met her when I was about 16, a time when I should’ve been fawning over the adolescent boys on the varsity football team. Instead I was purely enamored with Thoroughbred horses. The old saying that “experience is the best teacher” is a good one, even in the horse world. Once we’ve survived a tragedy or been publicly humiliated we’re extra sure not to do that same stupid thing again. Consider them lessons learned the hard way. Unfortunately, along the way to enlightenment we’re putting our horses in danger. I’ve worked with a variety of ponies in my life, each one of them memorable for different reasons. They range from sweet Amanda, who carefully carried nervous kids over the jumps, to wily Michael. If he became annoyed with the kid on his back he’d stop abruptly, fold up his legs and lie down. My pals and I have a saying about horses: “Eventually they all go lame.” Fortunately, most of those stories have a happy ending. The problem is diagnosed, treated and the horse returns to use. I, however, seem to have more than my fair share of the other type of lameness: the type that doesn’t go away. Recently I’ve been stuck in that scenario with Danny. This past holiday I received a warm and fuzzy Christmas gift from my husband. I’d been asking for a barn dog, something more rugged than our sweet but slightly neurotic Schnauzer, Betsy. I wanted a dog that could keep me company while I was puttering out back with the horses. What I got was a shaggy mouse-colored male puppy that looked like an elfin ewok. One of my longtime pals from the show circuit, Linda Tayne, happens to own the most popular feed store in town. Besides serving as a grocery store for my horses and dogs, it’s also one of my hangouts. On any given day I can stop by and have an animated chat with Linda or the horse-loving gals on her staff. It really is a crossroads of the community, and I never know who I’ll run into at the check-out counter. Better yet, I never know what will be sitting on the counter, whether it’s free samples of hoof conditioner or raffle tickets for the 4H club. Extra Safe or Extra Sorry? I recently got an early morning phone call from Jennifer, my vet. She was giving me an update on the current outbreak of the dreaded neurological strain of the equine herpes virus. A gelding in my region, Riverside County, had just been euthanized. A necropsy confirmed the disease. I spend most Wednesdays riding hunters for my trainer friend Sue. She served as rail-side coach for my sister and me when we were showing our own horses. Since Sue lives only a couple blocks away, it’s easy to stop by and hop on a horse. It helps her out when she’s extra busy and I get to ride a professionally schooled horse. It’s a perfect example of a win-win situation in the horse world. Attention! Are you a “mature” non-professional rider shopping for that perfect horse? Have the half-broke critters of your youth lost their appeal? Are you hoping to spend less time in the orthopedic surgeon’s office and more time in the saddle? In years past I spent abundant energy creating Christmas wish lists for my husband, family and friends. I circled pages in catalogs, bookmarked websites on the laptop and led thinly disguised guided tours through the local tack store, all in hopes that they’d buy my pre-selected gifts and then hand them over on December 25th. Someone needs to inform Danny that he is no longer a stallion. I thought he already understood this, because even though he was gelded only a year ago—after siring more than 20 foals, a fact that confounds me, given his less than ideal conformation—he is a perfect gentleman. He’s the Labrador retriever I always wanted. What goes through your horse’s mind when it sees another horse pulling a wagon? My horses can’t decide if they’re mystified or terrified. You know it’s time to body clip your horse when he begins to look as if he’s wearing a faux fur coat. Such was the case with Danny. Though he was sleek and shiny from spring to summer, by Halloween he resembled a yak. In fact, the hair on his lower legs began to curl, to the point that I actually had someone on the trails ask me if he were part Bashkir Curly. with horses can sometimes be a bumpy road, both figuratively and literally. morning by a blaze-faced gelding that resembles a topographical map of the Appalachians. continue banging my head atop my desk. phone to vet at the same time we’re running for the halter and lead rope. we had a pygmy goat named Gabby. unknown how long she’d been there, picking through dandelions and foxtails for sustenance. Control officials came to round up the cattle, they discovered the mare. How many times have you heard those excuses when your barn buddies come home from a show, ribbonless? They blame it on politics, a reference that has nothing to do with voting parties but more with the ribbons being decided due to favoritism. Is there a Crystal Ball in Your Barn? Do You Really Know your Horse? How Many Calories Did That Burn? You’d Breed Your Mare to My Horse? Really? Who Let the Haikus Out of the Barn? 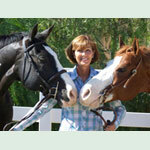 Cindy’s column in Horse Illustrated was my favorite and I am so glad to have found her here! I love the humor she shares and it is scary the things we share in common in our lives with horses! Being born and raised in Ca and marrying a non horsey husband I can relate ! Keep it coming. Thank you for the choices you have to pick from. I want a blog!! THat would be so cool and wow do I have some stories totell. Look for my horse Jabari Emir’s profile vote for us please. love your blogs! I also make sure i read every thing you write! you have such a wonderful connection with horses I hope to have the same! You’re a totally amazing horse person. What would the horse world do with out you?! I’m not commenting on the article, but would like to thank you so much for the article you wrote about my sister, Kathy Havens, in Chapter 7 of “A Passion For Horses”. It’s hard to believe it’s been almost 10 years since she left us. Love reading your blogs. I get a good laugh out of them. i cant wait to get my hore! Does anyone have a copy of Horse Illustrated magazine from September 1984?